The two partnered on a new report that offers a look at innovative ideas that some next generation chefs and restaurateurs are excited about. Have you ever wondered what restaurants in the future might look like? Will they feature menus that scientifically boost your mood or be retrofitted into solar-powered food trucks? 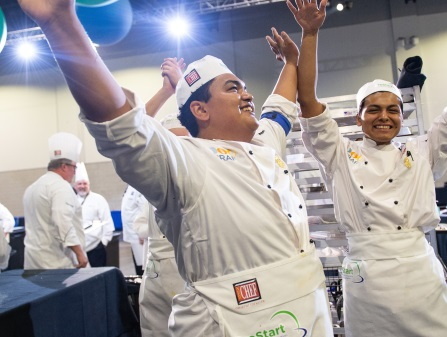 Those are just a couple of the ideas some next-generation chefs came up with at last year’s ProStart Invitational, according to a new National Restaurant Association Educational Foundation report produced in partnership with technology solutions company Oracle Food and Beverage. The report offers a look inside the competition, which highlighted the talents of U.S. high-school students on 92 teams, who competed for educational scholarships and industry recognition. The students, who are enrolled in the NRAEF’s ProStart program, showcased their skills by creating a variety of cutting-edge menus and restaurant concepts. The Invitational is held annually, in the spring. Last year’s competition was in Providence, R.I. This year, it is May 8-10, in Washington, D.C.
Chris Adams, Oracle’s vice president of food and beverage strategy, said the goal of the report is to capture the next generation’s insights on industry innovation, efficiency and technology. ProStart, a national program, is offered at high schools and technical schools throughout the United States, District of Columbia, the Territory of Guam and Department of Defense Education Activity schools in Europe and the Pacific. It is a two-year course of study and features hands-on training in basic culinary and management skills.